What Are Labrador Specific Behavior Traits? 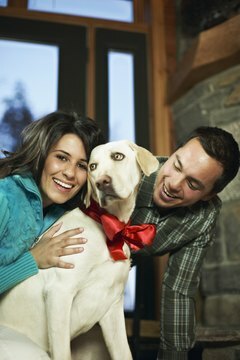 Labradors are often portrayed as the almost "perfect" family dogs. If you do not mind retrieving 50 tennis balls from under the couch, smelling a distinct "eau of wet Labby” aroma and owning a backyard that looks like a replica of planet Mars, a Labrador retriever with its endearing and not-so-endearing traits may be the right breed for you. Labradors are categorized by the American Kennel Club under the sporting group, which means they were originally used for hunting game. As an energetic hunting machine specializing in retrieving fowl from water and field settings, expect your Lab to be very active, especially when young. This may translate into bouts of uncontrollable romping where things in your home may go flying as if a hurricane just came through. Make sure you are steady on your feet or you may end up knocked over, too. An older Labrador may be a better choice if you have children or somebody infirm lives with you, recommends trainer, breeder and author Michele Welton. When you combine boundless stamina with an enthusiastic attitude toward life, you get a breed that is eager to please and be involved in your life. This is a dog that is happy when you give him a job, which can be something as simple as fetching a Frisbee at the park or retrieving a can of beer from the fridge. If you can channel this breed's energy and intelligence through training, you get a dog that can bring oodles of satisfaction. It is for good reason that Labradors are proudly one of the top choices for therapy and service dog work. If you are a neat freak, this breed may wreak havoc in your home. Expect to find Lab slime on the floor and on your car windows, fur everywhere imaginable and a yard resembling an archaeological excavation project with the occasional dinosaur bone. This breed is orally fixated, so Labs will lick, chew and eat anything in sight. On the plus side, you may expect a Lab to do the pre-wash cycle for you instead of your dishwasher, and you may never find a trace of a crumb on your kitchen floor. Best of all, your clothes may all boast a unique paw-print design after the random outing in your muddy yard. To release pent-up energy and keep your home neat, nothing beats a romp outside. With this breed, being left out in the yard or a brief walk around the neighborhood won't cut it; they need much more than that. If you love walking, jogging, hiking, camping or hunting, these dogs will be more than happy to accompany you in your outings and jump in the occasional pond. Left indoors alone, and with little mental stimulation, expect destructive chewing and unimaginable messes. The saying "an idle mind is the devil's workshop" definitely seems to apply to this breed. Labradors are considered the perfect family dog for a very good reason: They are mellow and pretty much get along with everyone. Blessed with a kind, outgoing, tractable nature, these dogs don't have a mean bone in them and are typically not aggressive toward man or animal, according to the American Kennel Club standard. These mellow fellows make poor watchdogs but can be your ideal companion if you love being outside, enjoy action and have tons of energy to survive the almost endless puppyhood stage. What Are the Different Kinds of Detrimental Inherited Traits for an American Bulldog? When Do Labradors Start to Shed Their Winter Coat? What Cats Make the Chirping Sound? What Does It Mean When a Dog Noses Away His Food?